Somu Chemicals and Pharmaceuticals (P) Ltd established in 2010, a new grass root manufacturing unit at Veerasandra industrial estate near Bangalore with the aim of providing Health Care to everyone by manufacturing Standard Herbal Extracts, Cosmetic intermediates, Nutraceutical products and fine chemicals. We are specialized in Condensation, Acetylation, Grignard reaction and Hydrolysis process with a well established Quality Control and R&D center. Piperine used to treat flatulence, gout, laryngitis and paralysis. Piperine used to treat abdominal tumors and gastric ulcers. Piperine improve the digestive system. 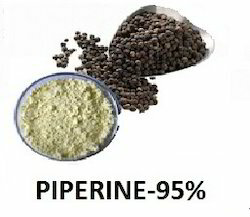 Piperine enhances the immune system.